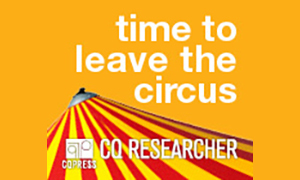 CQ Researcher provides award-winning in-depth coverage of the most important issues of today’s fast-paced news. Reports are written by experts, are footnoted, and professionally fact-checked. All reports include an overview, historical background, brief chronology, pro/con debate feature, plus recommended books and articles for additional research. Shorter "Hot Topics" articles provide a solid introduction to subjects most in demand by students. Perfect for getting to know a topic for a paper, exploring issues for ideas, or keeping up with the news. Easy to browse, and easy to search. All reports are 100% full text. Need help? Ask the friendly staff and librarians at the Information Services desk—ready to help you in person, on the phone, or by email! This research tip was brought to you by the Library’s Undergraduate Experience Team.